​Lisa graduated from the University of Massachusetts Amherst with a Bachelors of Science in Plant, Soil and Insect Sciences. While in school and after graduation Lisa worked on a variety of organic farms in Amherst, MA. Lisa loves working with the farm crew in the fields, driving the farm draft horse team (Malcolm and Red, see their bios below! ), thinking about soil, and growing plants. When not farming (which is rare), Lisa is an avid runner, hiker, cross-country skier, and spending time with her dogs, Clover and Violet. You can sometimes catch a glimpse of Lisa at the farm, but she is usually out in the fields or in a greenhouse. David has been working at the farm for six years. David is a Pownal, VT native. He worked at Whole Foods for six years in Boulder, CO before coming back east. David is our washing house master and runs the Monday CSA in Williamstown and the Bennington Farmers market! This is Luke's fouth season at the farm. Luke is from Rowayton, CT and graduated from University of Maine at Orono. Luke can make anything run and has a knack for vegetable production. Katie hails from Connecticut and went to school at Johnson and Wales for culinary arts! She is a first year crew member who has a talent for riding the transplanter and pruning tomatoes. Katie enjoys being around the plants and is a great crew member. Katie and three dogs and chickens! ​Kari, is an experienced farmer. Her jobs include; tractor driving, spot on harvester, crew leader, and general sweetheart to have around! Kari owns her own farm in Shushan, NY; where she will raise veggies! Kari spent six years in California growing veggies for the famous Chez Panisse! This is Ashley's third season at the farm. Ashley lives in Ct with her husband and son. Her talents are endless (including gourmet cakes!). She is your go to for our website content, farm events and delicious recipes for you to enjoy! This is Elizabeth's second season at the farm. She recently graduated from the University of Vermont where she studied Community Entrepreneurship in the College of Agriculture and Life Sciences. 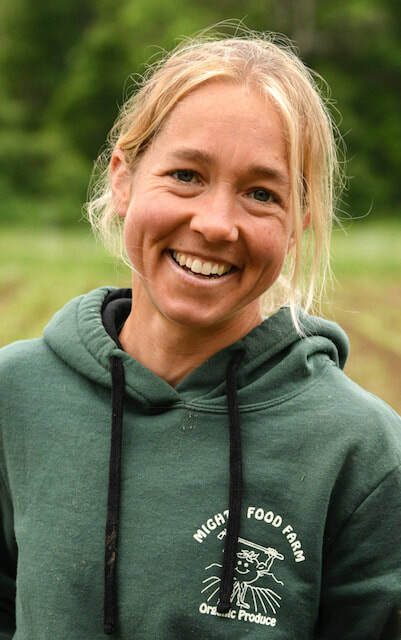 Before coming to Mighty Food Farm, Elizabeth was the Communications and Membership Assistant at Vermont Businesses for Social Responsibility (VBSR). Elizabeth works both the CSA weekend pick-ups. Malcolm and Red are the draft team on the farm. They spread compost, disc harrow, cultivate, and give wagon rides! Malcolm enjoys eating hay and requires lots of beauty rest. Red will do anything for an apple and is a self proclaimed "work-acholic." We love their gentle demeanors, work ethics, and ability to get work done with their only fuel being hay and fresh water. Our 2018 harvest season is right around the corner. Are you or someone you know interested in joining the Mighty Food Farm Crew? Click here to check out our available positions.